This is a second hand , completely out of the box as new telescope. It has been assembled but never been used. 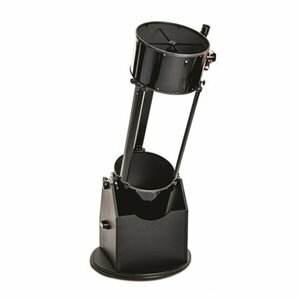 The 16-inch, 30mm-thick primary mirror is held in a nicely made die-cast metal, 18-point support cell, which wouldn’t be out of place on a far more expensive telescope. The cell’s well-ventilated design helps keep the mirror closer to ambient temperature, reducing convection currents that might disturb the view. Thermal acclimatisation is helped by a DC fan that blows onto the rear face of the mirror. This is powered by a 12V battery pack that sits on the base and plugs into a socket on the mirror cell. The alignment of the mirror cell is set by adjusting three strongly sprung black hand screws, and lightly locked off with three white ones. The cell also has three large rubber feet on the outer edge. The inclusion of these feet may not sound like much but it allows you to sit the whole bottom part of the scope on the ground during assembly without disturbing or damaging the collimation knobs – a welcome feature. Eyepieces - The scope comes with two eyepieces: a 2-inch, 30mm focal length, wide-field ‘Superview’ and a narrower-field 1.25-inch, 9mm Plössl. A 2-inch, 35mm extender-adaptor is also included with the scope. Both eyepieces gave pleasing views in the central region of the field. Finder - The addition of a 8x50 finder is a real bonus, especially for star-hopping under suburban skies where there are often too few naked-eye stars to easily use a red-dot finder. The finder has cross-wires to help with centring, and its alignment arrangement – using two screws and a opposing sprung rod – works really well. 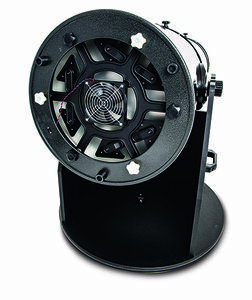 Altitude axis - The scope has two beautifully machined altitude axes, fixed to adjustable rails on the mirror box. The bearings have large adjuster knobs that can be used to increase or decrease the friction. These are also used to grip the mirror box when lifting it into position in the base. Adjustable balance - With the mirror unit out of the base, the altitude bearings can be moved along graduated rails and locked in position. This feature allows you to easily accommodate weight changes to the scope and avoids the need to mess around with counterweights to achieve the correct balance. Focuser - The scope includes a good-looking and functional 2-inch focuser with a 2- to 1.25-inch adaptor and brass compression rings for both sizes. Focusing is smooth and well-controlled with no noticeable backlash and has a 10:1 slow-motion knob at one end for critical focusing. It also features a friction-control thumbscrew. 16" Parabolic primary mirror (Estimated to be 1/4 to 1/8th Wave PV, well within diffraction limits).